Sunny M Kapikkad’s speeches analysing the anti-women, anti-Dalit, anti-constitutional traits of protests against SC verdict are attracting huge audiences. In the two months since the Supreme Court’s landmark judgement allowing women of all ages to offer prayers at the Sabarimala temple in Kerala – which led to widespread protests by Hindutva groups – there is one voice that has attracted considerable attention. 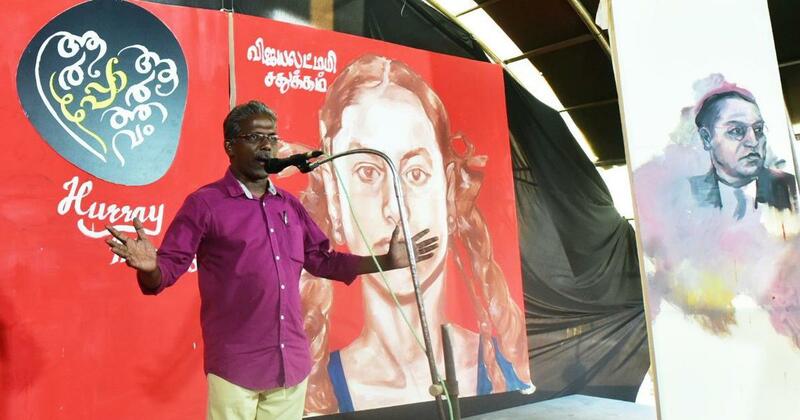 Writer and thinker Sunny M Kapikkad, who belongs to the Dalit community, has drawn huge crowds at meetings he has been addressing across the state in which he has analysed the anti-women, anti-Dalit and anti-constitutional traits of the protests against the court’s September 28 verdict. Prior to this judgment, women between the menstruating ages of 10 and 50 were banned from entering the temple in Kerala’s Pathanamthitta district. The court ruled that the ban amounted to gender discrimination. In his speeches, Kapikkad has examined issues such as constitutional morality, the Kerala renaissance, its subaltern origin, and the mainstream political Left’s inability to take the values of the renaissance forward. The Kerala renaissance refers to the many social reform movements against caste and gender oppression that had started in the region from the late 19th century onwards. Social reformers from other backward classes and Dalits initiated most of these movements. Sree Narayana Guru, a leader of the backward Ezhava community, is one of its prominent figures. Kapikkad is the chairman of the Bhoo Adhikara Samrakshana Samithi, a collective of outfits representing marginalised communities in the state. The Samithi is a staunch critic of the Kerala model of development, which Communist parties claim has helped the state achieve high social indicators. Kapikkad’s speeches are mainly addressed to Dalit, Adivasi and other marginalised sections of society. Among other things, he has said that the Supreme Court had upheld constitutional morality by lifting the restrictions on the entry of women to Sabarimala. He was the first public intellectual to call the protests at Sabarimala a mutiny by the Malayali Sudra community. This is a reference to Kerala’s influential Nair community. The Nair Service Society, a powerful community organisation formed in 1914, has been supporting the protests against the entry of women to the hilltop shrine since the very start of the protests. Kapikkad contends that in the absence of a Kshatriya community in the region, Malayali Sudra communities assumed the role of Kshatriyas by changing their caste name to Nair. The Nair community earned upper-caste status by bringing together all the Sudra castes, he said, and this is why they now wanted to “protect the Brahmanical traditions at Sabarimala”. His speeches are also popular on YouTube and social media platforms and their impact can be gauged by the fact that ordinary people have now started talking about the values of the Kerala renaissance and the role played in this movement by Dalit and backward class leaders such as Sree Narayana Guru, Ayya Vaikundar and Poikayil Appachan. His speeches also provide a counter-narrative to claims made by Hindutva outfits during their protests against the Supreme Court verdict. The political Left and mainstream society had so far largely ignored Kapikkad. Being an Ambedkarite, Kapikkad has consistently raised the issue of landlessness and oppression of Dalits, Adivasis and other marginalised communities. But the communists did not agree with him as they are known to ignore the caste aspect of inequality, according primacy to the class struggle instead. As a result he was never invited to speak at events organised by the communists or their affiliates. Why do the people who issued the death threats to you want to burn you alive? They threatened to kill me because I am a Dalit who has been consistently fighting Hindutva and Brahmanical forces with intellectual rigour. Fascists always want to silence writers and artists. But what struck me was their plan to burn me alive. They know that Dalits should be burnt alive. Hindutva outfits had burnt thousands of Dalits alive across India in the past. However, I am not taking these threats seriously. If Hindutva forces have decided to kill me, they will definitely do that. They have money power and human resources to execute their plan. As long as I am alive, I will continue my fight against Brahmanism and Hindutva forces. Mainstream communist parties claim that Kerala is an enlightened society. Do you think this is true in the wake of the protests against the Sabarimala judgment? Dalits and women’s rights groups have been contesting the claim that Kerala is an enlightened society for the last two decades. Society in Kerala ignored this criticism. I believe that Keralites live in an enlightened society. They have most of the traits of a modern society. But their enlightenment sensibilities work only in certain situations, and caste is the deciding factor in these situations. For example, examine the reaction of people in Kerala to the recent arrest of Suresh Nair, a Rashtriya Swayamsevak Sangh leader and an accused in the Ajmer Dargah blast in 2007 [that killed three people and left 17 others injured]. He was born in Kerala. He was on the run for the last 11 years. According to the National Investigation Agency, Nair had allegedly supplied the bomb that was planted at the Sufi shrine in Rajasthan. Kerala society did not show any signs of nervousness when he was arrested [on November 25]. There was no anxiety either. People in Kerala took the arrest for granted because he belongs to the upper caste Nair community. The same people would have reacted differently had the NIA arrested a Muslim on terror charges. They would have dug deeper and established many conspiracy theories. That is why I am saying the enlightenment sensibilities of Malayalis are heavily linked to caste identity. Sunny M Kapikkad’s speeches against Sabarimala protests are attracting large audiences. You always speak about the growth of neo-Brahmanism in Kerala in your speeches. What is neo-Brahmanism and how does it flourish? Brahmanism never remained constant in Kerala society. It has changed form and functioning style with time. But no changes happened to the concept that Brahmanical power is sacred. By the term Brahmanism, I do not mean the power, privileges and interests of Brahmins as a community, but the negation of the spirit of liberty, equality and fraternity. Brahmanical practices in the 19th century mainly focussed on religious rituals. 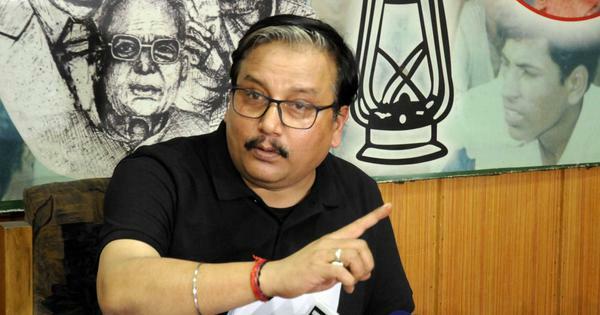 But in the 21st century, it transformed into a political narrative and this is known as neo-Brahmanism, which thrives on the premise that India has a rich Brahmanical tradition and all Indians should protect Brahmin culture if they want to defend India. This narrative has attracted a large number of Dalits to neo-Brahmanical movements. Neo-Brahmanical movements have flourished in Kerala despite it having an aura of being the most progressive state. Can the Sabarimala protests be considered part of the neo-brahmanical movement? Of course, the protests are indeed organised by neo-Brahmanical movements. The upper caste Nair community led the protests from the front. The Nair Service Society brought together many Hindu organisations to protect Brahmanical powers. Mainstream political parties could not challenge the [influential] Nair Service Society due to the pressures of electoral politics. The Sangh Parivar cleverly channelised this to its advantage. Mainstream left parties in Kerala wrongly analysed the reasons for the protests against the Sabarimala verdict. They just blamed Sangh Parivar for the trouble and turned a blind eye towards the neo-Brahmanical movements led by the Nairs. Why do you call Nairs “Malayali Sudras?” What is their influence on Kerala society? I call Nairs Malayali Sudras based on historical evidence. As you know, traditional Kshatriyas never lived in Kerala. Capitalising on that vacuum, the Sudra community anointed themselves as Kshatriyas and started to protect the Brahmanical power structure. The Nair community earned upper caste status by bringing together all the Sudra castes. The effort was headed by Mannthu Padmanabhan, the founder of the Nair Service Society. Currently, the Nair community has got a huge stake in government resources in Kerala. But they still complain that upper caste communities are in deep trouble in Kerala and they need reservations in jobs. Moreover, they are spreading hatred towards other religions by alleging that the fortunes of the state are being looted by Christians and Muslims. They were even able to convince liberal Hindus with this propaganda. Nair Service Society and Padmanabhan had taken the lead in forming the first Hindu Mahamadal which aimed to work for the Hindus, with the help of Ezhava leader R Shankar. It was a failed project, but Padmanabhan did what Sangh Parivar is doing now. How did neo-Brahmanism change the language of political discourse in Kerala? The politically conscious, Left-oriented Kerala society was familiar with terms such as “capitalism”, “socialism” and “class struggle” until they were replaced by a new set of Right-wing vocabulary, such as “tradition”, “tantri”, royal family and “Thantra Samuchayam”, after the protests against the entry of women [into Sabarimala] began in the first week of October. Wider acceptance to these terms surprised many political observers. But I am not surprised. For, I knew that the idea of class politics will not work in the effort to counter neo-Brahmanical formations. This is the time we highlighted the icons of the Kerala Renaissance and their works to liberate Kerala society from upper-caste hegemony. Kerala Chief Minister Pinarayi Vijayan is one of the few Communist Party of India (Marxist) leaders who understood the importance of the renaissance. 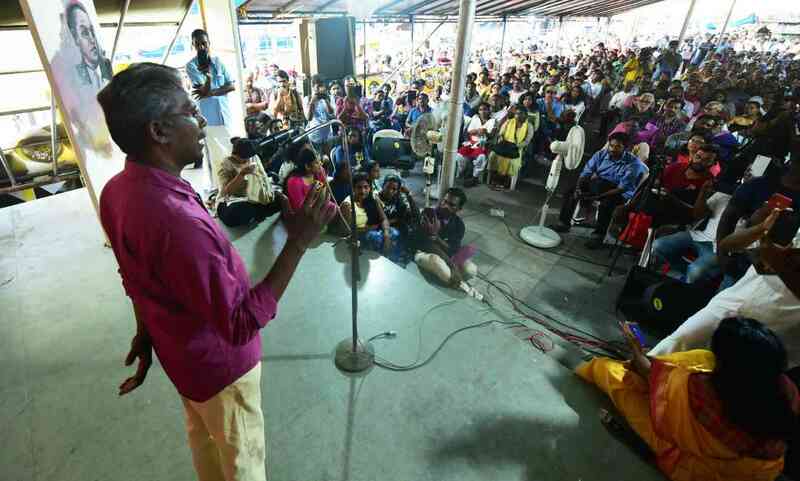 When Hindutva outfits intensified their protests, shouting slogans of “Save Sabarimala”, he addressed a series of public meetings exhorting people to remember the teachings of renaissance leaders Sree Narayana Guru and Ayyankali. I think it is a well thought out strategy. Since then Vijayan has been keeping mum on Left-supported agrarian struggles of Kayyur, Karivellur and Punnapra-Vayalar as he knew this is the time to address caste issues to thwart the plans of the neo-Brahmanical movements. India got its first Dalit president in the late KR Narayanan in 1997 and first Dalit chief justice of India in KG Balakrishnan in 2007. Both were from Kerala. Did the renaissance play a role in their achievements? Of course. The renaissance did play a major role in their achievements because it enabled Dalits and people from the lower strata of society earn an education. I think KR Narayanan became Indian president only because he joined the Congress. If he was with the CPI(M) [Communist Party of India (Marxist)], at best he would have become the president of Kurichithanam gram panchayat [where Narayanan was born]. No Dalit has ever found a place in the party’s politburo, the highest decision-making body in its 53-year-old history. What are your plans to counter neo-Brahmanical movements? As a first step, we have to denounce Brahmanical powers. We will announce that those powers are not sacred. It is a medieval concept and is totally anti-democratic. Besides, Dalits, backward communities and Adivasis should back off from the protests that are being held with an ultimate aim to protect Brahmanism. Sunny Kapikkad addresses a gathering in Thrissur on November 20. (Video in Malayalam). Sunny M Kapikkad speaks at an event to celebrate menstruation – Arppo Arthavam – in Kochi on November 25. (Video in Malayalam). Sunny M Kapikkad speaks on "Constitution and equal rights" in Palakkad on November 1. (Video in Malayalam).